What Will Happen to the North Korea Summit Coin? 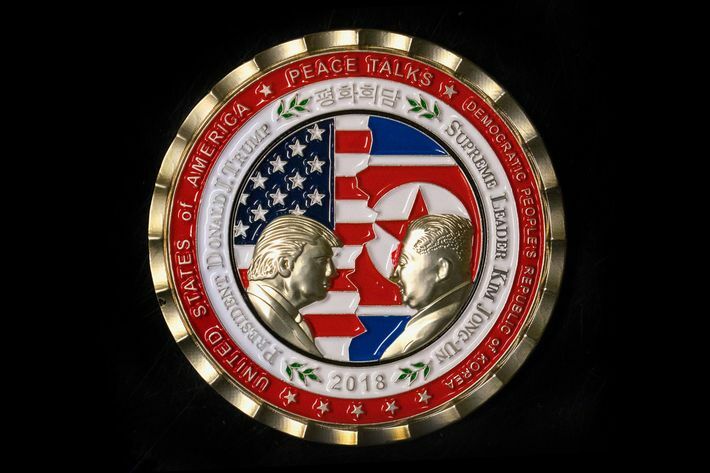 On Monday, the United States minted a garish commemorative coin to celebrate next month’s planned meeting between Donald Trump and Kim Jong-un in Singapore. On Thursday, the meeting fell apart. Within hours, the coins were put on discount as the White House gift shop’s deal of the day, the original $24.95 price tag slashed to $19.95. If you’re wondering why the White House would go ahead with the production of the coin given the meeting’s cancellation, the gift shop attempts to explain: “The Coin Will be Made Whether or Not the Summit Occurs as Scheduled, Because the Theme is Coming Closer to Peace and Celebrates the Act of Communication Among Countries.” Sounds like the coin maker isn’t granting refunds. 1. 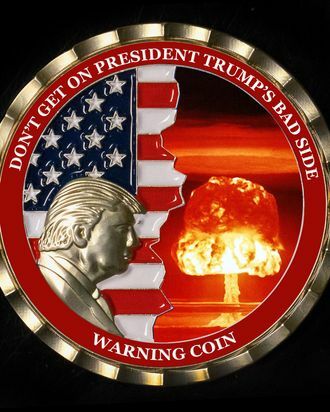 Make it a “warning coin.” Gone are the peace talks, replaced by a return to the same “fire and fury” rhetoric that dominated 2017. It makes sense then to replace Kim’s image on the peace coin with a mushroom cloud, which is what Trump is warning will replace him if he keeps screwing around. 2. Change Kim’s face to Brian Kilmeade’s and make it a coin commemorating his latest Fox & Friends interview. Nice way to mark his 23rd appearance on Fox News since taking office. 3. Pretend this was the plan all along and make other coins for events that will never happen. A coin commemorating a meeting that isn’t happening seems silly on its own, but if it’s a part of a collection with the “Man on Mars” and “Trump Releases His Tax Returns” coins, then it fits right in. 4. Give them to Dennis Rodman. The former Celebrity Apprentice contestant is probably pretty bummed right now. 5. Tell Don Jr. they’re chocolate coins and see how long he spends trying to open them. Hours. 6. Use it to commemorate a summit with Alex Jones. The conspiracy theorist has interviewed Trump before he was elected, but not since. Since the depiction of Kim already has the same number of chins as Jones, it shouldn’t be hard to make the face look like his.